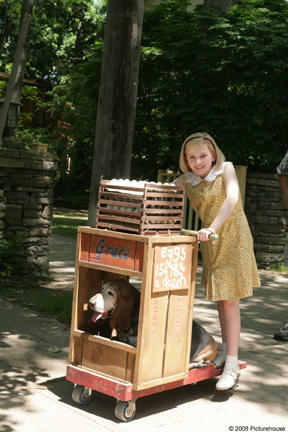 Abigail Breslin in "Kit Kittredge: An American Girl." Abigail Breslin and Darryn Lucio in "Kit Kittredge: An American Girl." Abigail Breslin on the set of "Rango." Abigail Breslin and Sofia Vassilieva at the after party of the New York premiere of "My Sister's Keeper." Aaron Eckhart as Nick and Abigail Breslin as Zoe in "No Reservations." Abigail Breslin and Julia Ormond in "Kit Kittredge: An American Girl." Abigail Breslin in "Definitely, Maybe." Madison Davenport, Abigail Breslin and Brieanne Jansen in "Kit Kittredge: An American Girl." Catherine Zeta-Jones and Abigail Breslin in "No Reservations." Abigail Breslin and Catherine Zeta-Jones in "No Reservations." 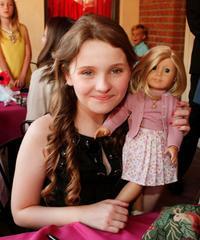 Abigail Breslin at the afterparty of the California premiere of "Kit Kittredge: An American Girl." Abigail Breslin at the California premiere of "Rango." Abigail Breslin in "Nim's Island." Abigail Breslin at the New York premiere of "My Sister's Keeper." Abigail Breslin as Zoe in "No Reservations." Catherine Zeta-Jones, Abigail Breslin and Aaron Eckhart in "No Reservations." Actress Abigail Breslin at the N.Y. premiere of "Definitely, Maybe." Abigail Breslin at the California premiere of "The Call." Abigail Breslin at the 79th Annual Academy Awards. Abigail Breslin at the Lexus Critic's Choice Awards After Party in Santa Monica. Abigail Breslin at the 13th Annual Screen Actors Guild Awards. 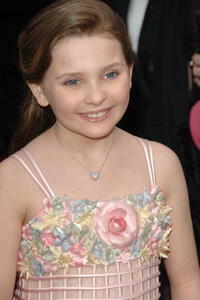 Abigail Breslin the N.Y. premiere of "Little Miss Sunshine." Abigail Breslin at the 18th Annual Palm Springs International Film Festival 2007 Gala Awards Presentation in Palm Springs. Abigail Breslin the 79th annual Academy Award nominees luncheon in Beverly Hills. Abigail Breslin at the 64th Annual Golden Globe Awards. Abigail Breslin at the opening night party for Sundance Institute At BAM with a special screening of "Little Miss Sunshine." Abigail Breslin at the LAFF closing night premiere of "Little Miss Sunshine." Abigail Breslin at the Orange British Academy Film Awards in London. Abigail Breslin at the 7th Annual AFI Awards luncheon in L.A.
Abigail Breslin at the 16th Annual Gotham Awards in N.Y.
Abigail Breslin at the Inaugural British Academy Film and Television Arts Nominees Reception. Abigail Breslin at the Fox Searchlight Official Oscar/Spirit Awards Party in Beverly Hills. Abigail Breslin in "Ender's Game." Abigail Breslin as Anna and Sofia Vassilieva as Kate in "My Sister's Keeper." Evan Ellingson as Jesse and Abigail Breslin as Anna in "My Sister's Keeper." Abigail Breslin and Emma Stone in "Zombieland." Abigail Breslin as Casey in "The Call." Alec Baldwin as Campbell Alexander and Abigail Breslin as Anna in "My Sister's Keeper." Sofia Vassilieva as Kate and Abigail Breslin as Anna in "My Sister's Keeper." Abigail Breslin as Anna in "My Sister's Keeper." Abigail Breslin as Anna and Jason Patric as Brian in "My Sister's Keeper." 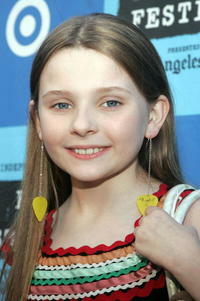 Abigail Breslin at the premiere of "Nims Island." Abigail Breslin at the 2008 Kids Choice Awards. Cameron Diaz as Sara and Abigail Breslin as Anna in "My Sister's Keeper." Abigail Breslin as Anna and Alec Baldwin as Campbell Alexander in "My Sister's Keeper." Abigail Breslin at the California premiere of "New Year's Eve."